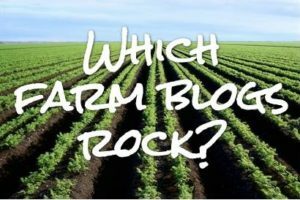 What's your favorite farm blog? - JP loves LIFE! What’s your favorite farm blog? I love crowd-sourcing information. It’s frequently the way I find the best information. I’ve seen lots of blog rolls and lists of farm blogs, heck I have a few lists of my own! And I’ve seen lists that compiled the top 10,20, even 50 farm blogs. Every time I look at those I wonder how people could decide who rates higher. So in a conversation with some other farm bloggers, I decided to resurrect an idea I had at New Years with a bit of a twist…. I’m running a survey basically…. asking all of you to help me identify the best bloggers when it comes to handling farm topics. And since there are various kinds of farm blogs, I’m going to put places for different kinds of blogs on here. And since some people do video, twitter or Facebook and don’t blog, I’m producing another post for those too. I figure I will get far more thought by asking our entire community their thoughts than if just a few put their minds to it so this can be something of a Best of Farm Social Media.